As a young child, Shaquan Wilson was separated from her mother and sent to live in a string of foster homes that shattered her sense of security. Nearly two decades later, a tearful separation was happening again – but this time to Wilson and her 1-year-old daughter, Ariayah. Evicted from her North Hollywood apartment last summer, Wilson, 21, became homeless — forced to live in her car while her infant daughter was sent to be with her father. But Wilson was far from helpless. She dialed 2-1-1, the countywide referral service funded in part by First 5 LA, and was connected to the Los Angeles House of Ruth, where she learned of a new housing facility being built for homeless families with young children. Following an application process – during which time she and her daughter were reunited at Wilson’s grandmother’s home – the pair were welcomed last fall to their new home: a one-bedroom apartment at Whittier Place in Los Angeles. Constructed with funding from First 5 LA’s $35 million, five-year Homeless Permanent Supportive Housing Initiative (PSH), Whittier Place is the second of five housing facilities to be constructed between 2014 and 2017. So far, more than 1,400 formerly homeless families in Los Angeles County have been housed by the initiative, which is comprised of housing construction and rental assistance and complemented by supportive services such as child care, job outplacement, homework support for kids, financial literacy and referrals to medical facilities. According to Linda Jenkins, a manager with the Community Development Commission of the County of Los Angeles, a number of studies show that permanent and supportive housing for homeless families has a profound effect on young children. The Community Development Commission is the lead contractor for the PSH Initiative. Recently, city, county and state officials have announced strategies to address homelessness in the state and in the area surrounding Los Angeles. From 2013 to 2015 alone, the county’s homeless count has grown by 12 percent to 44,000 persons, including families and young children. 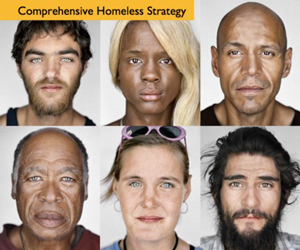 Both the county and city strategies address how best to spend the $100 million pledged last year by each government entity to address homelessness issues. Set to be voted on in February, the plans are both coordinated and comprehensive. Some components of the two plans would help homeless families, including rapid rehousing and homeless prevention. The county would also provide continued funding through the budget year of the rental assistance program currently funded by First 5 LA that is slated to conclude in March. “We are excited to have been on the forefront of a coordinated effort to house homeless families in L.A. County,” said First 5 LA Program Officer Sharon Murphy. First 5 LA’s mission is, in partnership with others, to strengthen families, communities, and our systems of services and supports so all children in L.A. County enter kindergarten ready to succeed in school and life. First 5 LA’s PSH Initiative is one way the agency is leveraging its investment to spur a broader, sustainable solution to address homelessness among families with young children in L.A. County. Last year, First 5 LA and Harder + Company Community Research conducted a nine month evaluation of First 5 LA’s PSH Initiative. The evaluation found that agencies that collaborated with and leveraged resources with other agencies, or had strong internal networks to which they could refer clients, reported stronger outcomes for their clients. Wilson could not agree more. After spending years as a child not knowing who would care for her or where she would live next, she is grateful that her daughter will not have to go through the same.